You know when you've just about scraped out most of a tube of lipstick, but there is still some left in the very bottom? One day, a few weeks ago, frustrated that it was such an ordeal every time I went to put lipstick on, I decided to get that last bit out, using a table knife and toothpick (yes, I did get every last bit out), and turn the remaining lip color into lip gloss. 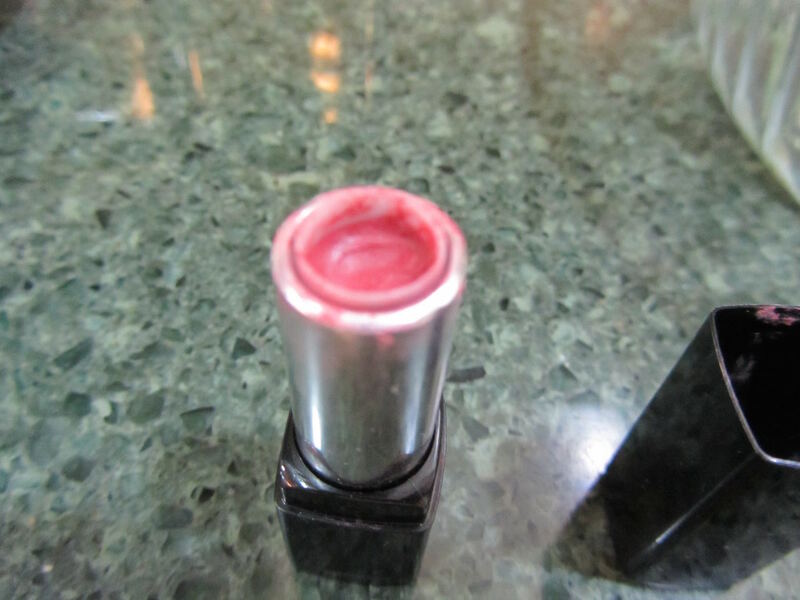 I put the salvaged lipstick into a small glass bowl, along with several slices off a tube of clear chapstick. I melted this in a short microwave burst, and stirred together. 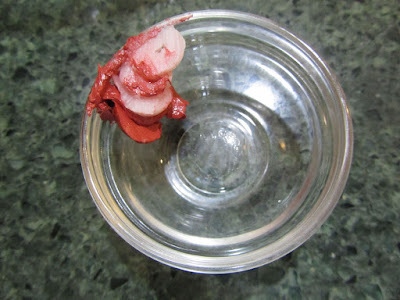 Since I had intended to make lip gloss I also stirred in some Vaseline (petroleum jelly). I scraped all of this into a tiny screw-cap container. Voila! Homemade lip gloss. 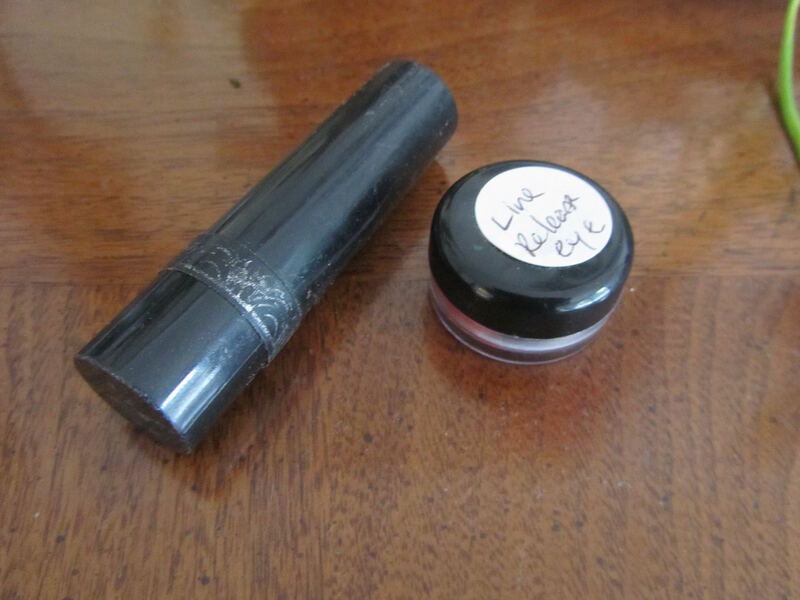 The container is from a cosmetic sample from Nordstrom. It's just the right size for something like lip gloss. It fits into a pocket or cosmetic bag in my purse, and the screw-on lid means it doesn't leak. Here's an indication of just how small it is. Lipstick on the left, "new" lip gloss on the right. I really like the mixture of the 3 ingredients. The lipstick adds the color component, the Vaseline creates some shine, and the chapstick keeps the gloss from becoming too sloppy and bleeding onto the rest of my face, while maintaining the color longer. I used roughly 1/3 of each ingredient. Since I like sheer color on my lips I have really been enjoying this gloss. Again, like I said, kinda "old school" but I thought you might like to see that I am frugal in many areas of my life, not just grocery shopping! This reminds me of when I was just a kid. I melted crayons (I think) with some of my mothers lipstick. (No microwave back in the day..) What a mess! Neither one of was very happy about that trial! Yours is much better! Oh my! I bet that was a bad day for you and your mother! Can you at least laugh about it now? Kids' minds dream up some interesting experiments. What was your intention with mixing melted crayons and lipstick? I had my share of well-intentioned, but bad outcome, experiments as a child. I also use a toothpick to clean out my lip balm tube. I buy Natural Ice medicated and it is no where to be found anymore except through Amazon. I also find that these tubes don't carry near as much as say 10 years ago. I feel like it's empty in a very short time. 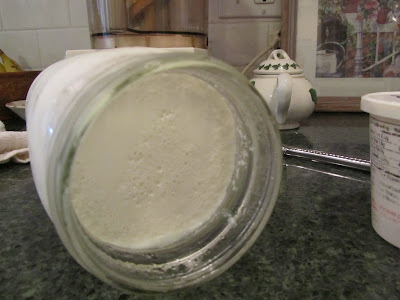 I just scoop it out when I can't wind it out anymore and then push it into another half used container that I might have in my purse or bedside. Hmmm, I hadn't thought that tubes of lip balm (or probably even lipstick) don't have as much in them as they used to. Even more reason to get every last bit out. It kind of bothers me that there is no way to buy refills for these tubes. The packaging is probably at least half of the cost, and the empty tubes just go in the garbage. Good job getting every last bit out of your lip balm, Alice! I assume you use your finger to apply your frugal lip balm. Does the mixture leave color on your finger? That's a good question. The answer -- not that much. In fact, if I'm putting the lip gloss on in the spot where I put the rest of my make-up on, I just wipe my fingers on a small towel, and the color hasn't permanently stained the towels. If I'm putting gloss on while out running errands, I wipe any extra off on a tissue in my pocket, or just rub the excess into the skin on the back of my other hand. It doesn't seem to be a big deal for me. The color is not very intense, being a 1 part color to 2 parts transparent ratio. I've been using commercial lip glosses that are packaged similarly since I was a teen, and never even thought about the excess color as a problem. Hope you are enjoying today. Did you get the big snowfall after all? It's still snowing, so the totals are still out. However, it didn't snow as much last night as predicted, so I think we'll be closer to 8" than a foot. The problem is that this is a wet snow that is heavy to shovel. Wet snow -- it doesn't snow here, much, but when it does it is wet and heavy. Tree branches tend to break or whole trees come down under the weight of wet snow in our area. I hope that you don't have much to shovel. Very clever! I'm afraid my thrifty beauty task of the day was to apply hair color from a box--I'm not as good as you are about finding creative money-saving ideas. Don't downplay your savings on coloring your hair at home! You just saved yourself about $40 or so. A color job at JCPenneys' salon is $55, I think. By doing your own hair at home, guessing you used a box that cost under $10, and you color every 2 months, you will save $240 or more a year. That's not chump change! I still color my own hair at home. The brand I was using has discontinued the product I was using, so I have switched brands and can no longer get 2 color jobs out of 1 box, but I am still only paying about $7.50 every other month. I will keep doing this at home until for whatever reasons I cannot get a good color job from a box for myself. Then I'll reevaluate. Not only does it save money, but it saves me time. I don't have to go out to a salon, wait for my appt, and come back home. I think it would take 1+ hours out of my day if I did salon hair. Whereas, by doing it at home, it takes about 30 minutes from start to washed hair. So I'm happy with my choice. Do you use a permanent or semi-permanent hair color? I'm still just using a semi-permanent color. Since my hair has so many shades in it, naturally, the semi-permanent blends in nicely, and fades naturally. Have a great day, Kris! Now go out someplace and show off your awesome hair! I use a semi-permanent color (Clairol Natural Instincts medium brown)--that's the only brand I can find that has a semi-permanent color. I find, like you, that it fades pretty naturally. I have to do it every 5 weeks or so--my hair tends to be oily so I really need to wash it every other day, and I'm sure that fades my color. You're right, it's a substantial money saver and I watch for sales/coupons to get the best deal. Like you, I'll keep doing this till it doesn't work for me anymore, and then re-evaluate. Luckily I'm not heavily gray so I think I'm good to go for awhile. It's frustrating when a company discontinues a color or changes the name of the color! I use Natural Instincts, too (Medium Golden Brown or Lightest Golden Brown, depending on season -- lighter for summer). I was using a product by L'Oreal and found I could get two jobs out of one box. But Clairol's product seemed to need the whole box. I think you're right on frequent washings causing more fade. Do you use a shampoo for dyed hair? That seems to make a difference for me. But I will admit, by the end of 8 weeks, the roots are really showing, and some grays are peeking through. I'm not heavily gray either. I think that can be a deciding factor for some women to get a salon color job. On shampoos for dyed hair, I've tried 3 different brands, and have had success with 2 of the brands. One was a Redken product, I think. It was pricey, about $14/bottle. But I don't use a lot of shampoo and made that bottle last a year. The other good one is also expensive, $14.30 on Amazon, Curls Blueberry Bliss Hair Wash. It's for dry hair, but also especially good for holding color. It's sulfate-free, and I think that's what to look for in shampoo for colored hair. My last bottle lasted for 9 months. Like I said, I try to use as little shampoo as possible, and because my hair is dry and curly I can get away with not washing it as often (once every 5-7 days). And, I can use my Swagbucks to pay for this shampoo. Anyway, you might want to try a sulfate-free shampoo to get as much time out of each hair coloring. Also, I do really like the conditioner that comes in the Clairol kit, it's much better than cheap drugstore conditioners. Ha, Ha, Ha! I also used Natural Instincts light golden brown until I couldn't find it anymore. I noticed the rinse part of this product rinsed away a lot of the brown. I switched to a cheap color $2.99 also light brown and it did just as well in the color dept. but didn't watch it go down the drain when I rinsed it out. I also noticed my cheap brand could easily have been used 1/2 now and 1/2 later. I'm not heavily gray either but the forehead part and near the ears seem to stick out with gray. I almost have to wash my hair everyday because I get bed head with flat spots or hair that sticks out in a bump. Seems like we have similar hair coloring needs! My hair is fairly straight and shorter in length--bed head is also an issue with me--wish I could get away with 5-7 days between shampoos! Lili, I use Suave's shampoo for colored hair, but I will keep your suggestions in mind. Alice, my Meijer is hit or miss with the Natural Instincts but I've been able to find it (often cheaper!) at Target. Meijer has better sales, though. I buy hair color online. I check around various sites to see who has it on sale. Right now walgreens.com has Natural Instincts buy 1, get 1 50% off, so 2 boxes cost under $6 each. Shipping at Walgreen's is free for $35 purchases, so I would need to either buy more hair color, or find other items I needed. target.com has a $5 giftcard with $20 purchase in the beauty section (hair color/care, skin care, personal care). I believe shipping is free if you spend $35 at Target. So, I was looking at 3 boxes of hair color, at $7.99 each (brings to $20.97), so I get the $5 gift card, which brings the net cost of each box to $5.32 each. I still need to find $15 worth of items that I need at Target to make that deal, otherwise I'd have to pay shipping or have it shipped to the store. I also check Amazon prices, sometimes they beat everyone else, but not right now on this product. oops, on target.com I meant it's currently $6.99/box, not $7.99/box. That makes better math! 6.99 X 3 = 20.97. Brilliant, Lili. 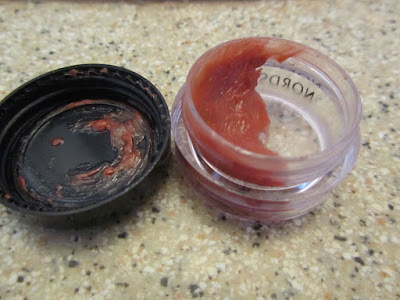 :) A great idea to turn it into a gloss pot. A nice way to extend the life of the remaining color even farther. I agree with Alice (hello, Alice! ), I think that some lipsticks aren't as big/full as they once were. Seems like they run out a lot faster than they used to, even though I use each less often. I think those wind-up eye pencils are a lot of plastic for very little color, and that always bothers me, so I stick with the wood-cased ones. Even still, when I sharpen it, I am shaving away some perfectly good color along with the wood bits. At least you found a solution to the broken off part, messy and annoying that it is. Good job getting yours while on sale, and not paying the full-price! Your DS who cut his own hair this winter, did he use a razor for cutting, or scissors? My husband uses a razor with attachments, and that thing has been such a good investment. It works pretty well. There is a bit of a learning curve with it, though. For myself and my daughters, since our hair is longer, I just use scissors. My MIL gave me a small pair of utility scissors about 15 years ago. Everyone in the family knows these are my haircutting scissors and they are only used for hair (to keep them as sharp as possible). I have no idea if real hair-cutting scissors would work better. I'd like to give them a try some time. Hope your week is going well, Sara! I only get my hair cut every three months or so and that is only recently. I needed to lighten up the huge amount of hair that I have so there are layers at the bottom and cut shoulder length. I just need it maintained once every three months. Hubby cuts his own hair down to bald. He likes it bald. Dad thinks I'm his personal barber and so I use the shaver and put on the attachment #2 or #3 depending on the season. Then I trim his inside ears, nose hairs (yuck! ), and then his neck. I call mom over to look it over (I do that more for fun) and once in a while she has me trim a bit more here and there. It's definitely not perfect but he doesn't care and I don't care. I once even let my youngest daughter take hold of the shaver and we just laughed while she ran that thing all over his head. 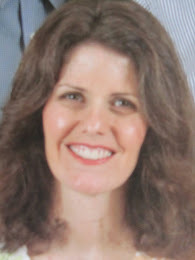 My hair is still mostly brown with gray accents--not pretty gray or white, sort of dingy--I guess I'm just a bit vain about my hair color (and I'm a little sensitive about being confused as my children's grandmother instead of their mother--a by-product of being an older mom!). Gray or white hair looks lovely on many ladies, but I'm not one of them! Kris, I love your description "dingy." I've told my sister that the top of my head looks "dusty" with the gray strands mixed with brown. Sara, I use the Covergirl perfect point eye pencil--you twist it when you need more pencil so less waste--I mostly like it but it can be smudgy--but I do like that there is less waste and mess. It's under $5 at Target. Lili, thanks for the hair color pricing info. And I had to look up "dingy" after you mentioned it--I had a "is that really a word and if so, did I spell it right??" moment. We cut the men's hair in the family with electric clippers like you and Alice. DH has cut his own flattop for 30 years. Our DS's have combable hair, so I usually do the back, neck, ear areas with the clippers and a tapered attachment, and then cut the top with scissors. When they were babies/toddlers, I did it all with scissors. I cut mine with scissors like you. DS has a beard, so he keeps clippers for that, and did his hair all with the clippers this winter. The back is the hardest, and you can't shave the neck to "high and tight" trying to see it in a hand mirror. But it worked well enough under the circumstances. Alice, it's definitely harder to cut your own hair, especially when it's long. I learned a couple of tricks for layering mine myself from my old stylist; but if you have a good one that's convenient and not too pricey, I'm all for it. I used to enjoy getting shampooed when I went to a stylist. Very relaxing. :) I've been doing mine for about 25 years, and know what I want/like; and I love that when I decide I need a trim, I can do it right then over the sink. LOL Also, mine is curly, and it seems to be harder to find a stylist who will work with natural curl rather than against it. Like you with your dad, I am also part-time stylist for my invalid mom. I only see her about once a year, and a haircut is usually part of those days. She has trouble sitting up long enough, so sometimes we do it in sections, and she looks very silly in-between. We like to laugh about that. :) I cut it very short, but it's shoulder-length by the time I see her next, usually. Have you ever seen the rotary manual razor thingies that cut nose hair? My grandfather used one, and I think I've seen them for sale at Vermont Country Store. I don't know if I'm going gray gracefully, per se. I'm probably a little dingy, myself. I enhanced my color with semi-permanent a couple of times when I was young, but don't tolerate chemicals well and decided I didn't like it well enough to go on. Now, almost all of my peers color theirs; so I look older, by comparison, and my husband is Asian so isn't going gray yet. I figure I've earned all those gray hairs, and try to be proud of them. I ought to color, because then I'd look more like Lili's sister or cousin, again. LOL Right, Lili? But I DO notice that all the sudden some of the wispy layers around my face are a pretty almost-white -- like the old frost-and-tip -- a nice contrast. I look good in different colors now than I used to when I was more brunette. There are pros and cons, for sure! Hope you'll continue to find that color you like in that product you like to keep you feeling your best. I hate when companies change, too!!!! Yes, you could so look like a cousin, Sara! Oh, I didn't take it as a criticism of hair coloring. I kinda wish I could go natural but at this point, it's not my favorite option. Wow, we are all interested in frugal beauty tips, aren't we? Smart thinking on making the lip gloss out the old lipstick! I have no lipsticks left (think my teenagers must have used the last of the one tube I had) but love the sheer color as well so use the Burt's Bees "Shimmer" (I think). Not as frugal, though. Though I don't use lots so it last a long time. Reading through all the hair color comments above, I did have one suggestion to add. I colored for over 20 years before going natural about 3 years ago. I have very thick hair so always needed 1.5-2 boxes every 4-6 weeks (should have done every 4 with as much grey as I have but often waited till 6). My mom was the same and clued me in to going to Sally Beauty and buying the the color and developer separately. That way, you can mix exactly the amount you need (1/2 box or 3/4 box, no problem). I also invested in a bowl with a handle and coloring brush which allowed me to apply with more precision than a bottle did. But you could just use an old margarine tub for the bowl. Might be worth pricing in your area just to see if this would save you money. Thank you, Cat. I have thought of doing this. My grandmother bought the two components separately for years. I'll check Sally's website to see if I can buy the semi-permanent hair color in parts. One of the benefits that I can see to buying in parts is I wouldn't feel bad about redoing only the root section in 3 weeks time, if I didn't do a good job the last coloring, or touching up anywhere else. Thanks for the suggestion. Are you back from hiking, or is that still to come? Oh my goodness, Cat! I am so impressed! I hope that you had a marvelous time. Although MAC cosmetics are fairly pricy, they are excellent insofar as color saturation goes. They’ve always allowed customers to turn in their old packaging to be recycled. One receives credit towards new purchases for turning in the empty old tubes, frames etc. I've heard of MAC cosmetics, but never tried them. I'm glad that they take the empty packaging for recycling. It bothers me that there is so much plastic waste compared to usable product in some types of cosmetic containers. Thanks for providing this information!